Jitesh, a senior bank clerk, rejects a business load to an influential industrialist, Satish. The latter seeks intervention from a senior bank officer named Arora who conspires to get Jitesh removed. A few days later at the bank, Jitesh helps an unknown customer, who claims to be illiterate, to fill his withdrawal form. The customer is later identified as a conman who fraudulently withdraws money from someone else's account. Arora manipulates the situation and on charges of abetting a crime, Jitesh, is named in the chargesheet. Jitesh is suspended and faces a judicial inquiry which lasts for 14 long and painful years. At every step he gets the opportunity to pay a bribe and get reprieve, but he adamantly refuses to give a bribe. His plea for innocence falls on deaf ears of vigilance officers, bank officials, CID officers, court clerks and even the judge. Does Jitesh succeed to overcome adversity and his adversaries or does he succumb to all kinds of pressures? Read on to find the truth. Gireesh Sharma, soldier-turned-author, writes straight from his heart. Born in 1973 in a small hamlet near Aligarh, he was brought up by his grandfather-in-law, an active political leader. It was under his tutelage that he developed patriotic fervour and on turning 17 years of age, chose to join the Indian Air Force to serve the nation. After his retirement, he worked with several youth organisations and today actively participates in socio-political activities to bring a positive change in the country. He is working as a marketing manager in a software company and enjoys writing books during his spare time. 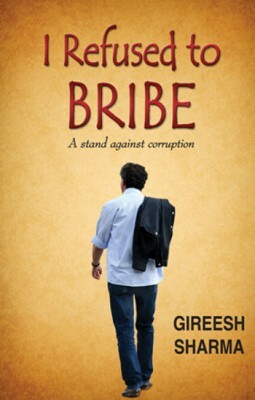 I Refused to Bribe is his first fiction, though he has written three popular non-fictions: 'Office Politics', 'How to Win the Heart of Your Wife' and 'Stay Free, Stay Happy'. When I first got an email from Gireesh Sharma asking me whether I would be interested in reviewing his book, I said yes because I found the premise very interesting. I belong to the generation which grew up hearing "Oh India? It's riddled with corruption," but this generation has always been known to make their own stand, fight in whatever way they can and protest. Having attended a college which was politically extremely involved, I know how passionate someone can become while they're trying to fight the system. Jitesh's story is no different. An innocent man becomes framed by his corrupt seniors because he refuses to pass a loan to a businessman. He refuses bribe, and when the trying years are ahead of him, he sticks firmly to his decision, his faith that good eventually triumphs over evil, unwavering. I liked how the story begins with Pannu, who has acquired his driving license through unfair means, showing it off to his mausaji, Mukund. Mukund happens to be Milli's husband...who in turn in the daughter of the protagonist of the story. The story, is frustratingly real. Because unfortunately our courts will drag on a case for as long as they can, if the money is fed to those who are higher up. In the light of recent events, I Refused to BRIBE comes as a warning, that if corruption is not in check, we'd soon have no place to go to for justice. The back blurb tells you most of the story, but what it keeps you turning the pages are the minor plot twists. People who expect Jitesh to get help from don't help him. Help keeps coming to him from unexpected quarters - and might I add, the whole story is realistically portrayed. The story, the author tells us in his foreword, is very real. He's merely fictionalized it for better reading. There were just two things which didn't sit well with me about the book. One, was the editing...it really does need some work. There's a difference between someone's "one-year old photograph when he was seventeen", and "photograph from one year ago when he was seventeen." The other was random characters seemed to tell us very important messages. I just wish those messages where delivered to us through one of the characters we grew acquainted with over time. For example at the party which celebrates Jitesh's victory it is one of the unnamed guests who tell us how corruption would eventually end of up ruining everything. I wish that had come from either the loyal lawyer, Saxena, or Arora's son, Vineet. Despite Jitesh being the protagonist, it is Saxena who has captured my heart. In a world where lawyers and crooked minds go together as synonyms, it was such a relief to be acquainted with someone like this honest lawyer. I really hope this person was not fictional, and true heroes like him still exist. Gireesh Sharma's book borders on didacticism. Then again, when one deals with writing about bribe in India, I'd barely expect it to be otherwise. Overall, I liked reading this book. You can buy your copies from any of the online shops. If you love reading about court room drama and fights against corruption, this is your cup of tea.